Starting up a new business can seem like a fairly daunting task—there’s a lot that goes into getting it just right. Once you’ve got the idea and the business plan, it’s time to figure out where the money you’re going to need to get started will come from. The process of finding funding can be complicated, but there are several options that may work for you. Though looking into a business loan or line of credit is absolutely worth your time, there are a couple of alternatives that are great for startup businesses. If you’re the kind of entrepreneur with experience in IT, you may be able to trade your services for office space—think about offering to act as the rest of the building’s IT guy in exchange for a break in rent. You may also find it worth looking into startup accelerators, or incubators. These businesses tend to be associated with major universities or community development groups, and are amazing resources for new startups. Incubators usually offer access to office space and the ability to consult with more experienced entrepreneurs and business moguls. 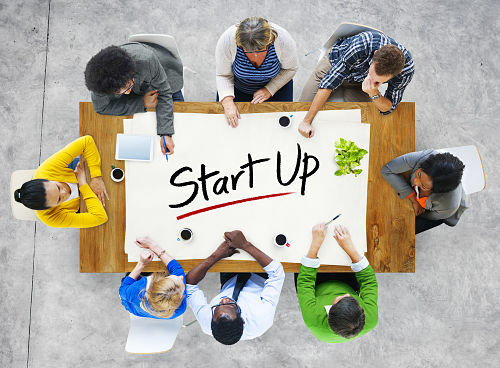 Many of these groups might also provide seed funding to get your startup on track. The most common route for accessing funds is a loan. Though trying to find a loan might be a little disheartening, especially for a startup, keep in mind how much further you’ll be able to push your business with a decent amount of funding. Though most traditional loans come from a bank or an accredited lender, startups can gain access to several more enticing options. If you live in a metropolitan area, there are likely several angel-investors worth applying to. These individuals are actually interested in helping out new startups, and can offer a ton of monetary and networking support. You may also want to look into soliciting venture capital investors. If you’re interested in taking this route, make sure that you are fully prepared to sell your business as the best investment opportunity to whomever you meet with. If you want a venture capital group to support you, you’re going to need a great business model and be able to prove that your startup is a major opportunity for the group you’re talking to. If you’re not really sure where to start when it comes down to preparing to talk to investors, our Learning Center has some great advice on how to get started. Keep in mind that investors will prefer businesses with a high profit potential and a proven business plan, and may not be the best option if you’re still figuring out where you’re taking your ideas. Aside from the options we’ve already looked over, some alternative lenders in Canada do offer startup loans as well. If you’re looking for advice on how to get started there, check out our info on the basics of business loans. You’ll need to have a decent business plan and credit score to get started, but these options give you a great head start on funding your business and offer regular repayments with a manageable interest rate. No matter what sector your startup hopes to join, these options are all worth looking into. Depending on the option you choose to pursue, you’ll find great resources—not only in funding but in advice—and your business will be well on its way to achieving everything you’ve dreamed of.